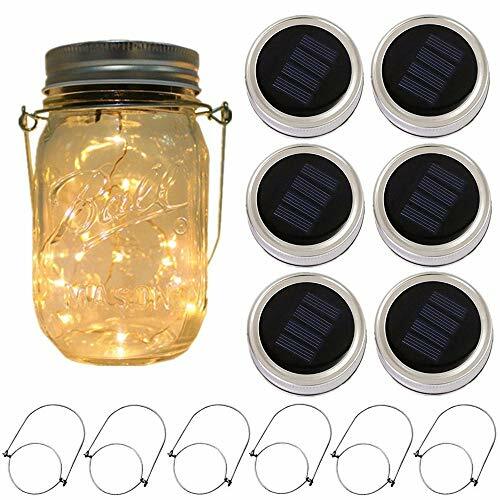 Fits for most regular mouth mason jar, put the solar panels with string lights into the jar lids ring. 2 3⁄8 in (60 mm) inner and 2 3⁄4 in (70 mm) outer diameter. Solar Mason Jar Lids Insert Light Kit (6 Hanger Mason Jar Not Included): Fits for most regular mouth mason jar,regular mouth, 2 3⁄8 in (60 mm) inner and 2 3⁄4 in (70 mm) outer diameter,put the solar panels with string lights into the jar lids ring.Switch on,the old-fashioned warn white luminous points emerge through the mason jar,just like the unforgettable fireflies' glow,makes your surroundings romantic and fairy. The lights are constant. Specifications: Magnificent copper wire with 20 bright old-fashioned warm white bulbs,makes your surroundings romantic and fairy.An easy On/Off switch underneath the lid,generally charge in the sun 6-8h will light up 9-12h (slide the switch to the "ON" position).Long lasting LED bulbs,little heat,safe to handle even after long-time use.